Alex bought the bird feeder at a yard sale. A sweet gesture, which certainly deserved a momentary break from my sarcasm. I said, “Thanks,” and pecked his cheek. When my parents retired and moved to Florida, I inherited my grandmother’s cedar chest. She had bought it years before she met and married my grandfather. Back then young ladies called them Hope Chests, filling them with all the items for a proper household: tatted doilies, antimacassars, starched white sheets, hand-sewn aprons, knitted baby booties. Now it sat below our bedroom window, holding blankets that came out smelling of mothballs. Alex lowered himself to it and pulled me down beside him. “Look, the diner’s open.” He pointed out the window to the feeder, a few birds taking tentative hops forward. “And in case you’re wondering what they are…” He grinned, producing Peterson Field Guides – Eastern Birds. “The directory,” he said, handing it to me. I read something once, don’t remember where, that men defined themselves by their jobs, and women by their relationships. If that were true, then in theory, I’d be just fine. I had a reasonably happy marriage. But that pearl of wisdom didn’t quite apply anymore. At least not to me. “It came from the top,” the regional vice president had said. “I’m helpless, and that’s the truth. There really isn’t anything I can do about it. If they want you gone, you’re gone.” And that quickly, after nearly eleven years, this middle-aged middle manager was out on the street. “There’s always something you can do about it,” he had said, rolling over. More birds flew into the feeder, perching on its ersatz front porch. One was small and gray and fat, with a pointy flip of feathers atop its head. I checked the Peterson’s: tufted titmouse. The other was an even smaller brown bird with a cocked tail and striped wings: house wren. The others I knew: two blue jays, big, noisy bullies, and a female cardinal, brown and red-tinged, sensibly less ostentatious than the males. You should’ve fought it. Didn’t he get it? I tossed the Peterson’s to the chest. I was helpless. Absolutely, the truth. There was nothing I could do. See more at The Kelsey Review homepage. © Copyright Gwen Jones 2012 All Rights Reserved. Exploring relationships, dealing with loss, and observing nature are all themes that jump off the pages of the 2012 edition of Kelsey Review, an arts journal published annually by Mercer County Community College (MCCC) and now available free at public libraries throughout Mercer County. 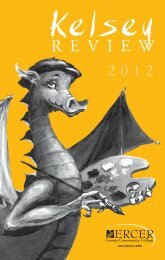 Now in its 31st year, the 2012 Review features 26 works of fiction, non-fiction and poetry by 16 writers who live, work or study in Mercer County. Print copies of the latest edition of Kelsey Review are available, free, at libraries and selected bookstores throughout Mercer County, or view and enjoy it here in a new, innovative turn-page digital format. You can print, share, and download this publication. Many thanks to Review editor Dr. Ed Carmien for all his help and for thinking “Hawks” is worth the read!